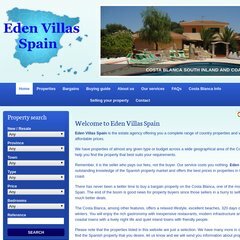 Topics: Eden Villas Spain, Properties, Bargains, Buying Guide, and Faqs. It is hosted by Ran Networks S.l (Madrid, Madrid,) using Apache/2 web server. It is written for PHP/5.2.17 language. Its 2 nameservers are ns1.ran.es, and ns2.ran.es. PING www. (212.34.158.30) 56(84) bytes of data.